The Umbrellas of Cherbourg (French: Les Parapluies de Cherbourg) is a 1964 French/German international co-production musical film directed by Jacques Demy, starring Catherine Deneuve and Nino Castelnuovo. The music was written by Michel Legrand. The film dialogue is all sung as recitative, even the most casual conversation (similar in style to an opera). Umbrellas is the middle film in an informal "romantic trilogy" of Demy films that share some of the same actors, characters and overall look; it comes after Lola (1961) and before The Young Girls of Rochefort (1967). The film was very successful in France with a total of 1,274,958 admissions. The plot is very similar to Marcel Pagnol's trilogy of plays entitled Marius, Fanny and César. The musical Fanny was based on Pagnol's trilogy. Madame Emery and her beautiful 17-year-old daughter Geneviève (Deneuve) sell umbrellas at their tiny (and financially struggling) boutique in the coastal town of Cherbourg in Normandy, France, in the late 1950s. Guy (Castelnuovo), is a handsome young auto mechanic who lives with, and cares for, his sickly aunt, godmother Elise. Guy and Geneviève are deeply in love; they want to get married, and they want to name their first child "Françoise". Madeleine (Ellen Farner) is the quiet, shy, dedicated young caregiver who looks after Guy's aunt; Madeleine also has feelings for Guy, but has not expressed this. Suddenly Guy is drafted and must leave to become a soldier in the Algerian War. The night before Guy leaves, he and Geneviève pledge their undying love. Then they make love (apparently for the first time) and the very next day, Guy leaves. After a couple of months it becomes clear that Geneviève is pregnant. She writes to Guy, but she feels abandoned when Guy writes back very infrequently; her mother tells her this is a sign that Guy has forgotten her, and she should give up on him. Geneviève has another suitor in Roland Cassard (Marc Michel), a quiet, kind, young Parisian jeweler, who is very wealthy, and who wants to marry her even after he finds out that she is carrying another man's child. Cassard had previously unsuccessfully wooed the title character in Lola; he relates a version of this story to Madame Emery, who repeatedly urges Geneviève to be sensible and embrace a secure future with Cassard. Geneviève finally decides she will accept Roland, and they are married in a great cathedral, but Geneviève does not seem happy with her choice. When Guy returns from the war with a slight limp from an injury, he learns that the umbrella store has been sold, and that Geneviève got married and left Cherbourg. As a returning serviceman, Guy has difficulties trying to continue with his previous life. He argues with his boss, quits his job, and goes to drink in a seedy port bar. He spends the night with a friendly prostitute named Jenny, who in the morning reveals that her name is actually Geneviève. Then, when he returns to his apartment, he discovers a distraught Madeleine, who tells him tearfully that his godmother died the night before. Guy sees that Madeleine loves him, and he cleans up his life with her encouragement. With an inheritance from his aunt, he is able to finance a new "American-style" Esso gas station. He asks Madeleine to marry him, and she accepts, though she first wonders if he is asking her out of despair at Geneviève's actions. The coda is set in December 1963, approximately six years after the earliest events. Guy is now managing the couple's Esso station. He is happily married, with his loving wife Madeleine and their little son François. It is Christmas Eve. Madeleine and François go for a short walk, leaving Guy briefly, after which a new Mercedes pulls into the station. The mink-clad driver turns out to be a sophisticated and wealthy Geneviève, accompanied by her (and Guy's) daughter Françoise, who remains in the car. Shocked to see each other, they go inside the station to talk. Geneviève explains that this is the first time she has been to Cherbourg since her marriage, and she is only in town on a detour. She also explains that her (middle-aged) mother died the previous autumn. It is apparent that her rich husband and her daughter Françoise are the only family she has left; she has had no children with Cassard. The two converse while Geneviève's car is being filled with gas, and when Geneviève asks Guy if he wants to meet their daughter, he declines. The ex-lovers part. As the film ends, Guy greets his wife with a kiss and plays with his son in the snow. The continuous music score and the colour photography had much to do with the popularity of this film. Formally the work is operatic, with the plot advanced entirely through dialogue sung with accompanying music. The color photography is bright and vivid: and the whole is united by an orchestral score of simple but sincere rhythms and tunes that permeate continuously a story of events lasting at least five years. The film score established composer Michel Legrand's reputation in Hollywood, where he later scored other films, winning three Oscars. In North America, two of the film's songs became hits and were recorded by many artists: "I Will Wait For You" (the main theme) and "Watch What Happens" (originally "Recit de Cassard" "Cassard's Story"). Both were given new English lyrics by lyricist Norman Gimbel. Tony Bennett's classic performance of the theme song was added to one version of the soundtrack CD. Harry James recorded a version of "Watch What Happens" on his 1977 album Comin' From A Good Place (Sheffield Lab LAB 6). The version released in 2004 on DVD by Koch-Lorber Films is a completely restored version of the original. The film was originally shot on Eastman negative stock which rapidly faded and became almost unusable. In addition, the various copies of the film used in the cinema circuit also gradually lost their quality, which meant that Umbrellas could never be seen with the rich colours that Demy had originally intended. Knowing that the Eastman stock would fade over time, Demy fortunately had the three main yellow, cyan and magenta color separation masters made on black and white negative films that could not fade (a process similar to the creation of the older Technicolor process: see the article on Technicolor for an explanation of this "three-strip" process). These black-and-white prints had greater longevity and in the 1990s, Demy's wife, film director Agnès Varda, headed a project to create a new colour negative from the three black and white separations from which newly restored full-color prints could then be made. 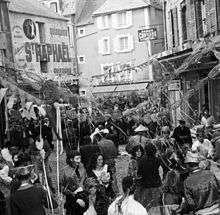 The resulting film recaptured Demy's vision of a fantastically colourful Cherbourg. In addition, composer Michel Legrand assisted in restoring the original four-track stereo sound masters to digital and remastering his score to produce a higher-quality version, now available on CD. A digital version was released in 2013, on the occasion of the 50th anniversary of its original release, on Blu-ray by Ciné Tamaris. This version was restored independently of the 2004 version with colour grading supervised by Demy's son Mathieu Demy. Nominated for four more Academy Awards at the 38th Academy Awards held in 1966, three for Legrand and Demy, though it did not win any: "Best Song" (for "I Will Wait For You"), "Best Original Score", "Best Scoring - Adaptation or Treatment" and "Best Screenplay Written Directly for the Screen". In 1979, an English-language stage adaptation, with translated lyrics by Sheldon Harnick, premiered at the Public Theater. In 2005 a major revision was produced at the Two River Theatre Company in Red Bank, New Jersey, with Harnick revising his adaptation/translation. A new orchestration was provided by musical director/conductor Nathan Hurwitz. The cast included Max von Essen as Guy, Heather Spore as Genevieve, Maureen Silliman as Madame Emery as well as Ken Krugman, Patti Perkins, Robyn Payne, Jonathan Kaplan, Steven Stein Grainger, Brett Rigby, and Sara Delaney. Direction was by artistic director Jonathan Fox and choreography was by Ginger Thatcher. In 2011, the Kneehigh Theatre Company presented the musical, starring Joanna Riding as Madame Emery, cabaret artist Meow Meow as the Maîtresse and Andrew Durand as Guy. The production was directed by Emma Rice. It was given tryouts at Leicester's Curve Theatre from 11 to 26 February 2011 and began previews in the West End at the Gielgud Theatre from 5 March, officially opening on 22 March. It was due to run until October 2011, but closed on 21 May 2011. The film was well received by critics. Review aggregation website Rotten Tomatoes gives it a score of 98% based on reviews from 48 critics, judging it "Certified Fresh" with the site's consensus: "Jacques Demy elevates the basic drama of everyday life into a soaring opera full of bittersweet passion and playful charm, featuring a timeless performance from Catherine Deneuve." ↑ "Les Parapluies de Cherbourg". BFI TV & Film Database. London: British Film Institute. Retrieved 23 December 2012. 1 2 "Les Parapluies de Cherbourg", JP's Box-Office. ↑ Bernard Weinraub, "At the Movies; A Woman Robs the Cradle", The New York Times, 7 August 1998. ↑ Erickson, Glenn (2004-04-03). 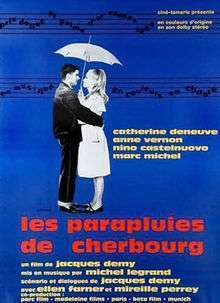 "DVD Savant Review: The Umbrellas of Cherbourg". dvdtalk.com. Retrieved 2007-12-09. ↑ "The Umbrellas of Cherbourg". Festival de Cannes. Retrieved 28 February 2009. ↑ "The 38th Academy Awards (1966) Nominees and Winners". oscars.org. Retrieved 5 November 2011. 1 2 "Riding, Meow to Lead West End Legrand's The Umbrellas of Cherbourg", Westend.Broadwayworld.com, 14 January 2011. ↑ "Umbrellas of Cherbourg", Londontheatre.co.uk, 14 January 2011. ↑ Michael Rosser, Andreas Wiseman (29 April 2013). "Cannes Classics 2013 line-up unveiled". Screen Daily. Retrieved 30 April 2013.